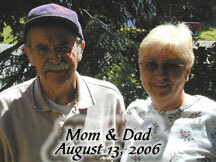 "Had a Dad" Alzheimer's Blog: 134 "I don't want it." My dad's in a real hospital room, finally, with a TV and a window (no bathroom, oddly). A CNA watches him 24/7. I went to see him in his new room yesterday and the day before. He got moved there on Tuesday. He's in a diaper with a catheter. He's got a massive urinary tract infection (they hurt like hell; no wonder he was flipping out) and is covered with bruises. He is still not eating or taking his medicine. I managed, on Wednesday, to get him to eat half a cookie, a bite of chocolate donut and some Coca-Cola. He kept sticking his fingers in his mouth like he had a hair on his tongue, but that wasn't it. His tongue is cracked and white from dehydration. They have him on a drip, but it doesn't seem to be helping much. He's still restrained, wrists only, but soft restraints, not the manacles he was in down in the ER. He can move both his arms quite a bit, just not enough for one hand to reach the other. So all his pick sores on his arms are getting better because he can't pick anymore. Yesterday he got another x-ray on his hip because he keeps saying it hurts. This is still from that fall on Saturday night. Yesterday's CNA told me she heard the girl who was supposed to be watching my dad took a 45 minute cigarette break and left him completely unattended. I can't find out her name or anything more about her. I am seeing our elder care lawyer today. I am not a lawsuit inclined person, but....if we can get some money toward his care, that would be helpful. I don't understand why the trained nursing staff cannot manage to get food and liquid and pills into my father. Isn't that THEIR JOB?! Why do I have to bring in food I paid for and make him eat? Why do they listen to him when he says he's not hungry and doesn't want his food? When I went on Wednesday, the first time I'd seen him since Sunday when he was so drugged and incoherent, he smiled and said "There she is!" and pointed at me. The aide said, "Who is she?" He looked at me and said, "That's...that's....that's her!" The aide tried to get him to say my name (ha-like he knows my name) or that I'm his daughter, but I told her he doesn't know any of that. Recognition & "That's her" is the best I hope for. So he was awake and alert, although his words were very slurred and often wrong (I provide translations most of the time). She told me he still wasn't eating or taking his medicines. Like I said, I got him to ingest some junk food--at least it's calories--without her help. The next day, I brought him a montage of pictures of me, my mom, my husband, the cat, the dog, and the old cat and old dog to hang up. I thought it might upset him to see the pets, but he just petted the picture of the new dog and said how "nice" it was. I stopped at Dairy Queen and got a Blizzard with peanut butter cups in it (happens to be my favorite, but my dad likes peanut butter too). My intent was to put his pills in the ice cream. The aide (a different one) got the head nurse and she offered to crush the pills. I got about 80% of the pills into him. He wouldn't take the second spoonful. So I was forced to eat the whole Blizzard myself, what a sacrifice. But it was $3, I can't buy $3 worth of ice cream every day to get my dad to take his pills! His dinner came right before I left. It was a really nice meal of linguini, a roll, chicken noodle soup, coffee and a glass of milk. The aide put the tray over his bed with the food. "I don't want it," he said, very clearly. Then he mumbled something which translates as "I'm not hungry." I got one forkful of linguini into him (and an equal amount all over him) but he pressed his mouth shut and turned his head away like a stubborn child. "I don't want that!" The aide got another forkful into him, and two spoonsfuls of soup. Then he started to get the "mean look" and his fists clenched and he started pushing the aide, and I told her to stop for a few minutes or he was going to hit one or both of us. Right after that I had to go, so I don't know if she got him to eat anymore after I left. She said if I bring some more ice cream in, they can label it with his name in their freezer and bring it out when I visit so I can make him take his pills. That's fine, saves me $100 a month in Dairy Queen (and who knows how many calories if I finish every one myself), but the point is THEY ARE THE NURSES; THEY SHOULD GIVE HIM THE GODDAMN PILLS. My mom might have found a nursing home right in town to take him. But there's vast and complicated paperwork to fill out which our elder care lawyer is helping with. She is wonderful and if anyone is in my area (Connecticut) and needs an elder care lawyer, I recommend her highly. E-mail me for her information or post a message here that's not anonymous so I can get back to you. Just to let you know, EVERYTIME my mother has been in the hospital, even when she was on a saline drip, once, for dehydration, SHE ALWAYS COMES OUT DEHYDRATED AND CONSTIPATED! This happened in a skilled nursing facility, as well. Medication has not yet been a problem, but, then, she hasn't yet begun to refuse medication and, as far as her diabetic oral meds, go, they switch her to injected insulin instead of her oral meds. I'm sure this is because it's easier for them to shoot rather than to prod; however, since she is not ON insulin for her diabetes, I find the choice highly questionable. I am with you all the way regarding your curiosity about why professional medical caregivers can't take care of their patients...us, the avocational caregivers, can?!?!? I also wanted you to know, I belong to an informal online support group for caregivers and was so shocked by the treatment your father received before and during his hospital admittance that I added what's called a "Discussion Post" over at that site and directed people to your posts 132 and 133. There are many people there who deal with the demented in various states...including the state your father was in (I'm very pleased to hear, by the way, that the primary culprit was a UTI...I'm VERY familiar with UTI behavior in the demented) prior to and during the first part of his admittance. I thought they'd be interested in know what can very easily happen when the pros attempt to handle the recalcitrant and fighting demented. Turns out there was good interest in your posts. So that you know where some of those visitors came (and are probably still coming) from, here's the address of that post: Could This Happen to You or Your Care Recipient?. I figured, one of the better things that can happen out of your experience is that people can be made aware of what is not only possible but probably in these circumstances...the first step to change. Turns out, people are reading and commenting on your posts. Thank you, Bert, for journaling here about your experiences with your Dad (and your Mom, by the way). Those in the thick of it need to "scream real loud" (Thank you Pee Wee Herman) when we're there, in the hopes that others, someday, won't have to scream. I totally understand your reluctance to sue...and I applaud your decision to seek redress, anyway, for the mistreatment of your father. This isn't about entitlement, this is about working on the pros to sit up and take notice. Insistence on redress, monetary or otherwise, usually (unfortunately), does the trick at this time. I don't think there is a person on the planet who could read your posts and not feel compelled to do something. If all we can do is spread your blog to everyone we know, it's something. You are stepping into the badlands of Alzheimer's disease. This disease is manageable to a point, and then all hell breaks loose. You don't have any idea it's coming until it happens. Then the shock of having professionals turn a deaf ear and a blind eye comes next. I've contacted every person I can think of, politicians, newspaper reporters, advocates for the elderly, those who need a window into this world, to follow your blog. You are not alone, many are watching and learning. This is exactly what blogging and the internet is all about - connecting parts of our individual worlds to one another - and being heard when you "scream real loud." I hear you, and my thoughts are with you.